Entomosporium Leaf Spot Disease is on the Rise! What causes this fungal disease and which plants are most susceptible? If you have Indian hawthorns or perhaps a screen of Photinias planted on your property, now is the time to check them for leaf spot disease. Cool nights, rainfall and high humidity will boost fungal diseases of all sorts in the landscape. As we visit properties around town, we’re noticing Entomosporium leaf spot exploding on these two popular landscape plants. Once infected, plants will drop leaves and blooms. Repeat infections send plants into a steady decline and plants typically will end up needed to be replaced. What is Entomosporium leaf spot disease? Entomosporium leaf spot, Entomosporium maculatum, is a fungal leaf spot disease. It commonly affects members of the rose family such as red tip photinia, quince, pear and Indian hawthorn. Once foliage is infected with the fungus it eventually dies and drops from the plant. The disease thrives in hot, humid climates. The unusually warm winter and early spring we had this year was the perfect environment in which the fungal disease could thrive. Indian Hawthorns that have lost their luster due to Entomosporium leaf spot. Because fungal spores are spread throughout the foliage through water droplets, plants that regularly receive overhead watering from a sprinkler system are particularly susceptible. When plant leaves aren’t able to dry fast enough, especially overnight, the fungal spores can spread and take hold quickly. If plants happen to be growing in a bit too much shade, as is often the case as shade trees grow larger, they will typically have even more problems with this fungal disease. If you have Indian Hawthorn or photinias planted, be sure to water them at the soil level, not on top of the leaves. If your plants have Entomosporium leaf spot, you’ll notice tiny red spots on the foliage, possibly with a yellow ring around the edges of the spots. The spots grow larger and darker, eventually covering the entire leaf. If your plants have this fungal disease, there are ways to treat it and reduce the spread. Remove infected leaves from the plant and the ground and bag them. Do not compost them or it’s possible spores will continue spreading in your landscape. Clean up leaf litter around the base of the plant to reduce further spreading of spores. Water at the soil line, not on top the foliage to help deter Entomosporium and other fungal diseases. Watering in the morning will give plants all day to dry their leaves. 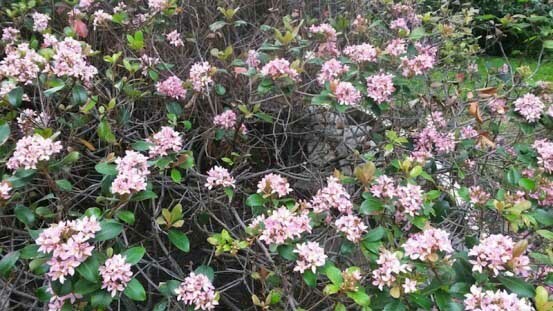 Planting your shrubs in the right place will always help reduce stress and disease problem. Indian hawthorns and photinias are at their best and strongest when planted in a full sun location. The key to healthier plants with reduced pest and disease issues is to follow good cultural care practices in the landscape. Planting plants in the right light exposure and soil conditions are essential. Speak to your local garden center about proper sun requirements or a plant's specific soil needs. Proper watering, fertilizing at the right time, and pruning when needed are all part of good plant management and should give your plants a long and beautiful life.